A medical student on duty in Stanley medical college in Chennai was allegedly attack by three people, while he was on duty in the casual ward. The three people are reported to be in an inebriated state when they came in for a treatment for one of them. They apparently got hyper as they alleged hospital was slow in providing treatment. 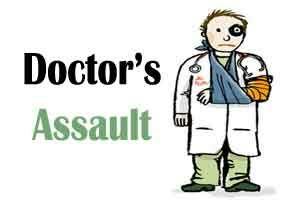 The issue of assault on doctors has been under attack by the medical fraternity in Chennai, which has been raising further questions on the Tamil Nadu Protection Act 2008 to tackle the issue. Three such incidents have been reported in last fortnight and a police complaint launched. Speaking to Express, Dr Ramesh, Resident Medical Officer (RMO) of the hospital, said Dr Bin Abraham Daniel, a second year post graduation student, who was on duty at the casuality ward was attacked by three people. “They came in for treatment for one of the three people, all were in an inebriated state. They suddenly attacked the doctor, saying the treatment is delayed,” he added. According to police, following the attack around 5 am on Wednesday, Dr Bin Abraham Daniel filed a complaint at Washermenpet-H1 police station. The case was registered under Tamil Nadu Police Protection Act. Of the three, Rajasekaran, Yuvaraj and Karthikeyan, police remanded the first two and a hunt is on for Karthikeyan, who is absconding. Around 700 Doctors at Madras Medical College, recently went on a Strike , after colleagues of theirs was allegedly verbally assaulted and threatened by 4 men. The incident goes back to Friday night, where an RTA ( road-traffic accident) patient was brought to the emergency of Madras Medical College and hospital in Chennai. The patient was had minor injury and abrasions and was clinically stable. Owing to the stable nature of the patient, the emergency doctors asked the patient to wait as there were more serious patients in line. Hearing this, the attendants, one of whom was a lawyer and the other an administrator at a political party, began to verbally abuse and threaten the resident doctors. It was only when all the medical doctors of the hospital gathered to support their colleagues, that they backed off.